Director Jee-woon Kim along with actors Byung-hun Lee and Min-sik Choi are three of the most talented people in Korean cinema today. Jee-woon has done such films as A Bittersweet Life and The Good, the Bad, the Weird, which both starred Byung-hun and Min-sik is most recognized for his performance in Oldboy, but was also fairly impressive in the drama Crying Fist among many others. 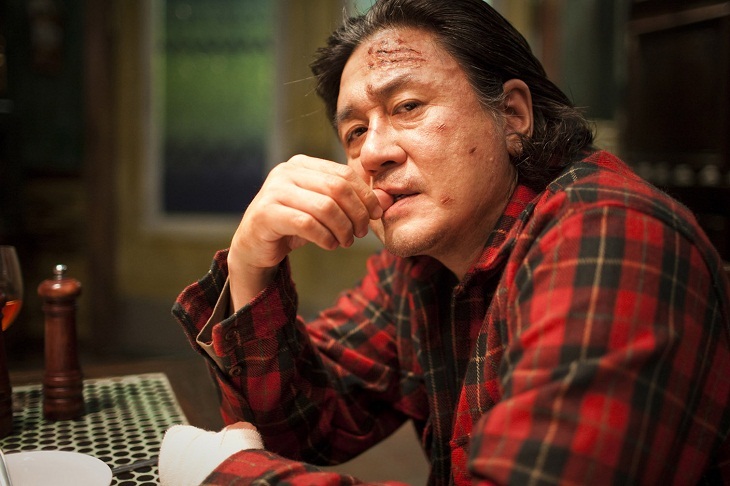 Oldboy is really the film that made me love Korean cinema. So when word broke that these three marvelous people were getting together to make a film, I knew I was already there. A little thriller called I Saw the Devil came together and became one of the most spectacularly intense thrillers to be released in quite some time. Late one snowy, winter night, a woman named Joo-yeon (San-ha Oh) sits stranded in her car waiting for a tow truck to arrive and help her fix a flat tire. She talks to her fiancé, Dae-hoon (Byung-hun), over the phone as she waits. It's Joo-yeon's birthday and Dae-hoon, a secret agent, gets caught up with work and can't be there with her on her special day. A strange man shows up and begins to pester Joo-yeon about fixing the tire himself. After declining his help, the man known as Kyung-chul (Min-sik) attacks Joo-yeon before brutally murdering her. Kyung-chul is actually a notorious serial killer who mostly kills women and young girls. As the investigation unfolds, Dae-hoon swears merciless revenge on Kyung-chul and a deadly game of cat and mouse begins. Does Dae-hoon really know when this game will end or has he already become a bigger monster than the man he now preys upon? The chemistry between Byung-hun Lee and Min-sik Choi is what really drives the film. Byung-Hun is the broken down shell of a man when he's not in the hunt, so to speak. He has several emotional breakdowns that are incredibly heart wrenching, but the urge he has to make this bloodthirsty maniac pay for taking the love of his life away takes a front seat to any sort of emotion he once had. Byung-hun portrays the struggle his character has between sadness and revenge flawlessly. Min-sik plays the role of a lunatic incredibly well. His character seems to lack that which makes a person who they are; morals, a conscience, and above all a soul. Killing is the only thing that brings out the real Kyung-Chul. His first initial reaction to someone trying to beat him at his own game is agitation and borderline out of control rage, but once he regains control he not only enjoys himself but claims it's the most fun he's ever had. Min-sik acts level headed when his kills go well, but the way he expresses how insane his character really is when things go bad for him is what makes his performance so memorable. While the scenes where Byung-hun and Min-sik fight with each other are great for obvious reasons, there's a scene at the end of the film where they both have a heart to heart conversation that is just spectacular. Every little glimpse you have of that confrontation leading up to that point is fantastic, as well. Jee-woon Kim certainly knows how to shoot a beautiful looking film. Lush and vibrant colors make grisly murders and spontaneous revenge tactics look much more pleasant than the blood that endlessly splatters all over every wall and floor in the film. Other than the brilliant colors, the cinematography is rather unique as well. There's a scene near the end of the film where Dae-Hoon is walking toward the camera on a deserted road. It's simple and shot like we're basically walking backwards in front of him while staring directly at his face. He eventually begins to cry; an uncontrollable sobbing. The way the scene is shot along with Byung-hun's performance made it one of the more memorable scenes in the film. There's another where Kyung-Chul gets picked up by a taxi. He gets into the front passenger seat while there's another man in the back, so there are three people in the car altogether including the driver. Kyung-Chul realizes he's going to have to beat these guys to the punch, so as their adrenaline escalates the camera rotates around the inside of the car. You get this continuous 360 degree shot of the action occurring inside this cab. It's amazing. Leave it to another Korean thriller revolving around revenge to make an impression on me. Jee-woon Kim's I Saw the Devil is a superbly acted, exceptionally written, grotesquely gorgeous film that'll make you cringe during some of the more horrific and blood soaked acts in the film while secretly leave you craving so much more. That craving is satisfied thanks to the interactions and chemistry between actors Byung-hun Lee and Min-Sik Choi. The disturbing content in the film is more than enough to satisfy the hungriest gore hounds out there while the captivating story will please anyone looking for something more than someone being chopped to pieces. I Saw the Devil is one of the most morbidly delightful films to be released in recent years.